The documents provided by the UN appear to confirm the fact of high treason by the fugitive president. The Main Military Prosecutor's Office of Ukraine has received from the UN a photocopy of Viktor Yanukovych's official statement in which he requested that Russia sends its troops to Ukraine in 2014. 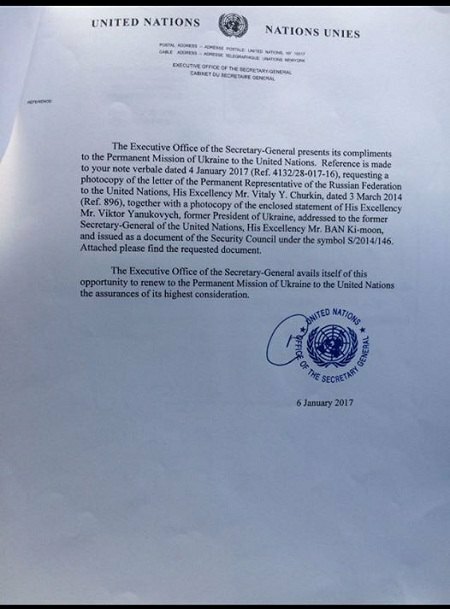 "The Permanent Mission of Ukraine has provided the Main Military Prosecutor's with an official letter from the UN Secretariat with an officially sealed certified photocopy of Yanukovych's 1 March 2014 statement in which he asked for Russian troops to be sent to Ukraine, as well as all official files which were added on behalf of Russia to the statement of Russia's UN envoy Churkin," Prosecutor-General Yuriy Lutsenko said on Facebook 17 January. The prosecutor-general pointed out that "the UN had recognized all the materials received by Ukraine as official documents submitted by the Russian Federation". "The investigation obtained irrefutable documentary evidence of high treason committed by Yanukovych," Lutsenko said, having noted that senior prosecutor in the Yanukovych probe has allowed him to disclose data obtained in the course of pre-trial investigation. 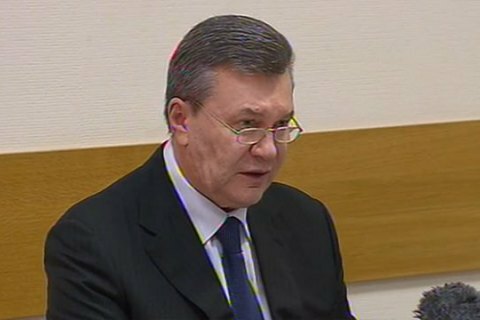 On November 28, 2016 Lutsenko said in Kyiv's Svyatoshinsky District Court that Yanukovych was indicted of high treason. Law enforcers charge Yanukovych of committing high treason on 1 March, 2014, while in the territory of the Russian Federation. The fugitive president sent a written request to Russian President Vladimir Putin to use the Russian troops on the territory of Ukraine. Subsequently, Lutsenko observed, this has led to the loss of Crimea and the objects of state property worth over 1.080 trln hryvnia by Ukraine.